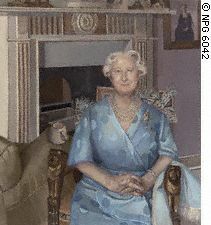 Alison Watt has just been awarded an OBE (Order of the British Empire) this year 2008 by the British Queen. She is the youngest artist at age 42 to be asked to do an artist-in-residency at the National Gallery which is culminating in an exhibition of her work over the past two years. People are asking whether she is an antidote to Damien Hirst and Tracy Emin who were leading artists of the wildly controversial group known as the YBA’s (Young British Artists) who achieved notoriety and fame through their shock approach to art. 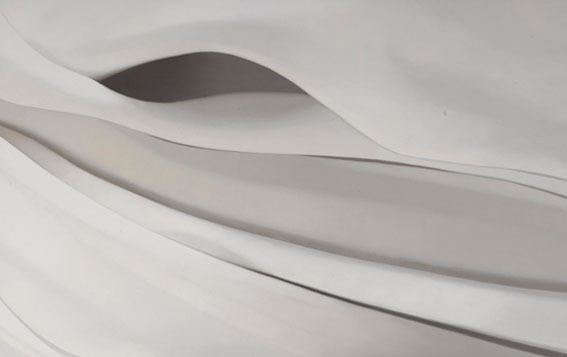 After the shock of these works of art, Alison Watt’s works are quietly lusciously sensual. 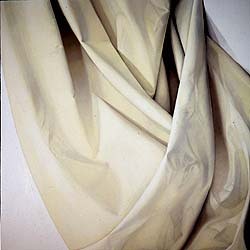 Alison Watt does “fabric painting.” She paints on canvas but her subject matter is cloth. So how did she get here at age 42? Her early works were dryly painted figurative canvases, often female nudes, in light filled interiors. 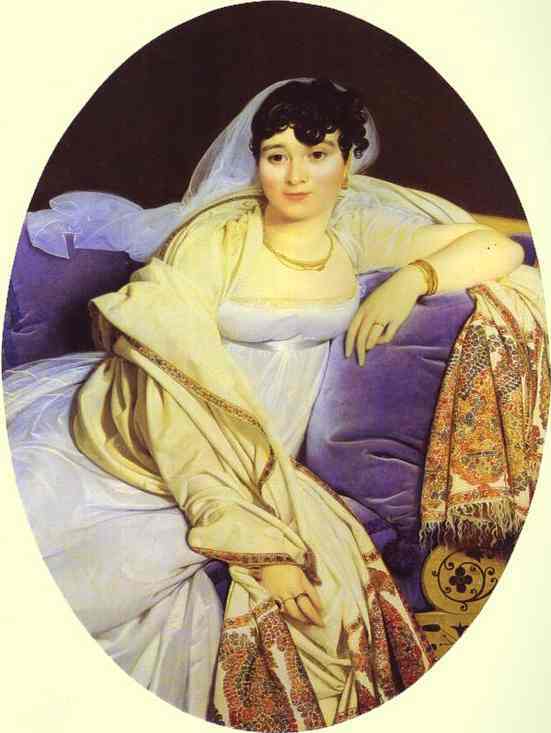 Gradually she become more absorbed in conveying the quality of cloth and she has said that she was very much inspired by Ingres and his painting of cloth and particularly his handling of folds as can be seen here in his painting of Madame Riviere. 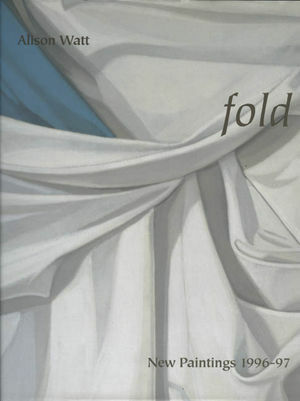 An exhibition of Watt’s work entitled Fold in 1997 at Edinburgh’s Fruitmarket Gallery was the first introducing fabric alongside her models. Some of the other works that were exhibited at the same time are below. 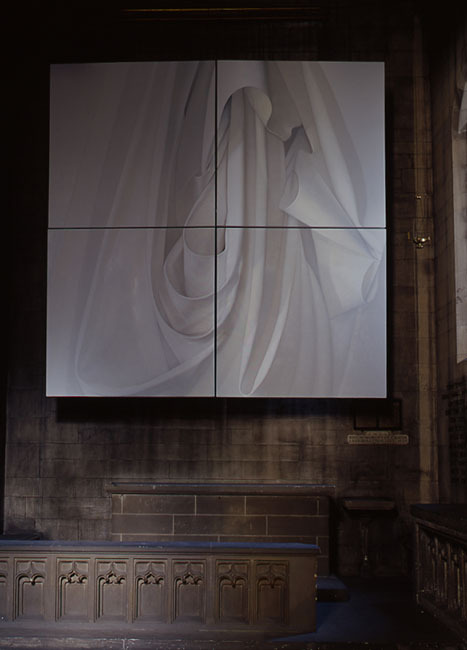 However, it was the installation of “Still” at Old St Paul’s Church that caught the eye of the National Gallery of London. They asked her to do a residency for two years, the culmination of which is the exhibition which is going on right now. She was the youngest artist at 42 to be so honored and followed in the footsteps of others such as Paula Rego, Ken Kiff and Peter Blake. What the residency meant was that she had the run of the galleries at any time of day, but especially after hours when she could study the paintings at her leisure without the interference of the general public. She could paint in the studio at the National Gallery and study the paintings on her breaks. Although she was very much inspired by Ingres and his treatment of fabric, after several months she came to find two other paintings really spoke to her. 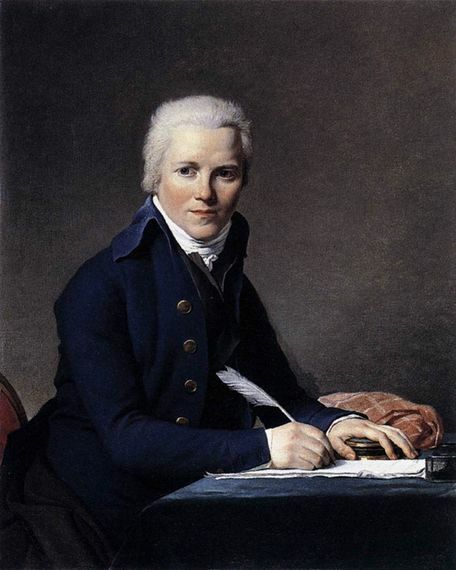 For the first two of her paintings in her National Gallery exhibit her starting point was the white cloth of a man’s stock worn at the neck in the portrait of “Jacobus Blauw” by his master, Jacques-Louis David. The sitter is wearing a plain blue coat with a high collar; a white stock wrapped around his neck is tied in a knot at his throat. 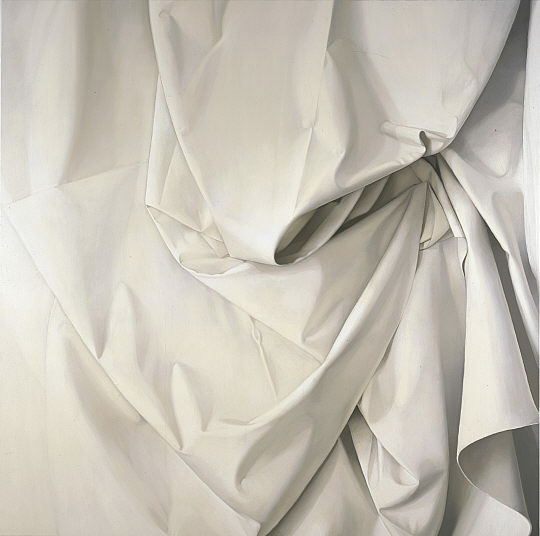 It is that knot which was the inspiration for her paintings Pulse and Echo, the titles suggesting the life hidden behind the white cloth. She was so taken with this painting that she has had this painting placed at the entrance of her exhibition. 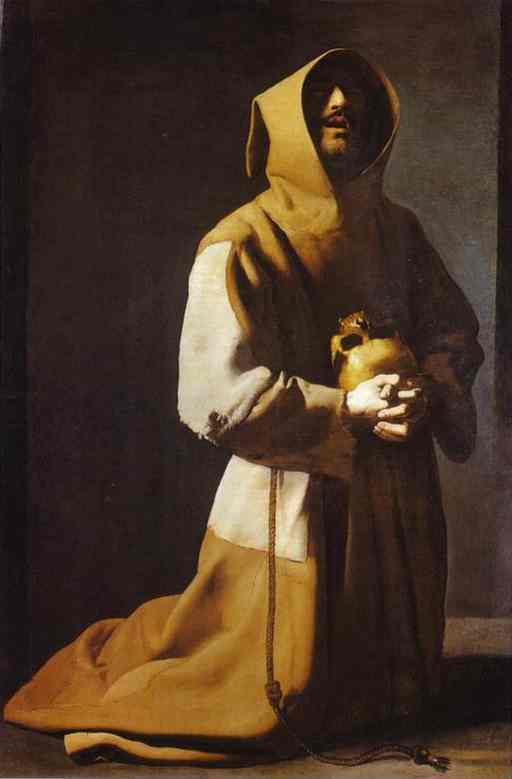 the depth of shadow in St Francis’ cowl and on his face is echoed in her painting named Phantom. 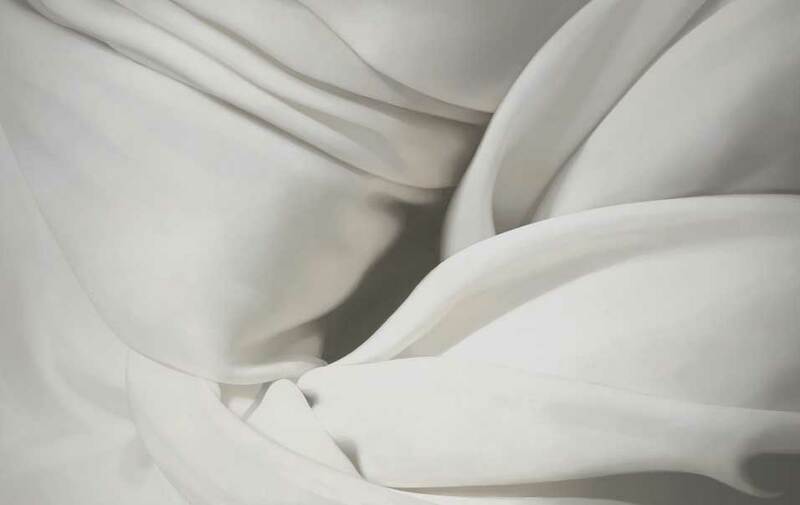 Phantom , detail, 2007 © The National Gallery, London. 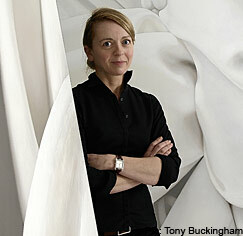 Alison at work in her studio showing the massive scale upon which she was working (©The National Gallery, London). On a final note I would like to mention that although we just see mostly white images, those who have seen the paintings speak of many colours being used. 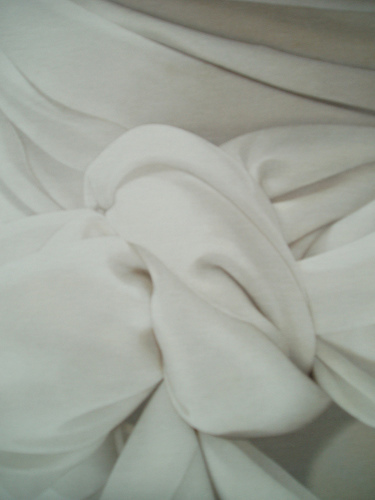 It is also to be noted that in the days of apprentices, the drapery was mostly left by the master for them to paint. Alison achieved these large scale paintings by herself without any assistance. so beautiful in white, and elegant ! 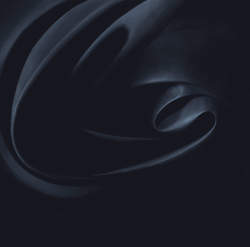 And not 5 minutes later I stumbled on the work of Edward Evans, who also uses fabric as the source of his images – but with an entirely different result. He adds chinese writing so that looks embossed, but his process includes sanding the canvas between layers of paint. The scale of the work certainly hits you first. She is magnifying the unregarded, and you can revel in nuance in a clear cool uncluttered space. Then you go back out into the colourful crowded galleries with their deep-coloured, fabric covered walls with their twiddly victorian trimmings, and of course all those complex colourful paintings — it’s quite a shift in focus! It’s wonderfully mysterious work. Thanks, Kanti, for bringing this fascinating work to our attention. 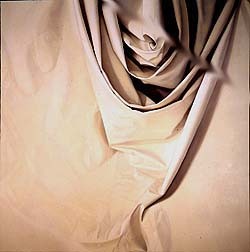 It seems perched between the human and the natural: sensuous like O’Keeffe’s flower portraits, flowing like the graphics in a fluid dynamics paper, yet so rooted in classical painting and hinting at the human presence. And then the scale. What a surprise to realize the size of her canvases in the last photo! I’ve seen the exhibition at the National Gallery in London and watched the video about her work which plays in the exhibition – and both are very impressive. Great blog post – I’ll mention it on my blog. Wow, a really interesting post. I really wish I could go see this! Thanks so much for the information. Her work is wonderful. 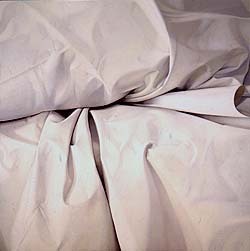 I remember Paula Rego’s work at the National Gallery from long ago..
Painting folded fabric might look easy and uncomplicated, but it sure isn’t! I particularly like the examples that seem to tell a story. My favorite is “Riviere” which looks to me like someone recently got out of bed. It is like the first page of a novel. 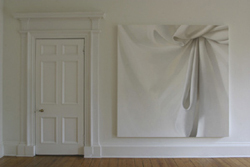 Her work also reminds me of ancient classic statuary with drapery. I wonder if she limits her research to old paintings and not statuary? It would be wonderful to see these in person – for the huge scale of the paintings, and the subtle color, as you say. Wow! Gorgeous work. I’m so glad to see an example of a female artist who receives accolades and respect for producing art that is wonderfully pleasing to the eye. For a while it seemed to me that only the “ugly” or “edgy” art was being taken seriously. And to be “pretty” was equated to being childish or superficial. Well, I guess you can’t be taken more seriously than if you’re honored by the Queen of England, can you? There is something to be said for brilliant technical skills combined with delicate treatment of simply beautiful forms. I’m so glad you highlighted her work. I wish I could see it in person!